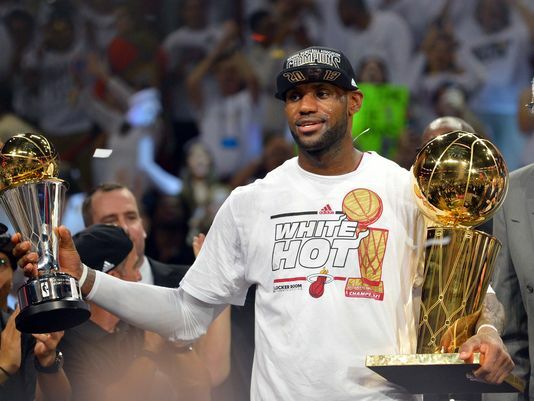 Lebron James holding the Larry O’Brien trophy (right) and the Bill Russell Finals MVP trophy (left). The Miami Heat won its second consecutive NBA title over the San Antonio Spurs after a tough series, which had to be extended to game 7 in Miami. It was a thrilling series in three years as they were on the verge of defeat in game 6 until Ray Allen shot a 3-point field goal to secure an overtime and won the game 6 and be decided who should be the NBA champion in game 7. I watched the entire series from game 1 to 7 and had to flood my wall on Facebook that annoyed some of my friends as I had been waiting that series for eight years to happen and had to watch to decide whether Lebron could cement himself to be one of the greatest of all time in the NBA the time by the he retire someday or cement Tim Duncan’s legacy further as one of the best NBA players in this generation. The path of the Miami Heat and the San Antonio Spurs to get the NBA Finals was different. The Heat’s path to the NBA finals was difficult compared to the Spurs as they had to reach game 7 to win the Eastern Conference Finals because they didn’t have immediate response to Roy Hibbert at the front court, Paul George at the back court, and the athleticism of the Pacers’ players. San Antonio Spurs had the easier path to the NBA Finals as they swept the Memphis Grizzlies, 4 games to nothing as the Memphis Grizzlies was too inexperienced to face the good combination of veteran and youth players of the Spurs and the Oklahoma City Thunder, who could have been the team to face the Miami Heat in the Finals, was eliminated by the Grizzlies due to Russell Westbrook injury in his right knee, rendering Thunder’s dream to have a Finals rematch with the Heat impossible. The entire Finals series was close as crucial games had to be decided with razor-thin margins in game 1, 6, and 7 while both teams had to win over each other with overwhelming margins in game 2, 3, 4, 5. The series was considered a relatively low-scoring and defense focused for both teams as starting and reserve players like James, Wade, Bosh, Chalmers, Miller, Allen, and Battier for the Heat and Duncan, Parker, Ginobili, Green, Neal, Diaw and Leonard for the Spurs had defend the ball just to win the series, therefore, the NBA title. Many fans and especially band wagoners had expected the Heat to win the series in an ease way, but they were wrong as the Spurs showed their courageous and tenancy efforts to fight for another NBA title despite of having their starting players way older than them. During game 1, the Spurs showed to the world that they could still made them tired and tougher to defend their title in 2012. The Heat accepted their challenge and proved the world that they were the best by forcing the game 6 into an overtime through Ray Allen’s 3-point field goal in the remaining seconds of the fourth quarter of the same game. Had Ray Allen’s 3 missed, the Spurs would have been the NBA champion, but of course, it didn’t happen. Spurs’ defeat was not really because of Ray Allen’s 3-point shoot, but because of fatal mistakes of their head coach, Gregg Popovich of playing Manu Ginobili too much minutes, who was inconsistent throughout the series and playing Tiago Splitter in the start of fourth quarter that gave an opportunity for the Heat to destroy their defense at the front court. The same mistakes were committed by Popovich in game 7 as Ginobili played the fourth and he got tired probably that’s why he missed passes and shoots that would have been a victory for the Spurs in game 7. The reason on why the Heat could not defeat the Spurs in 5 games was because of their weakness at the back court and the front court where Tim Duncan of the Spurs dominated the them on the latter. Lebron James still had his weakness at the perimeter (although improving throughout the years), Dwyane Wade was not 100% healthy, and Chris Bosh was inconsistent at the back court. They had to rely Chalmers, Miller, Battier, and Allen to win the series to match Spurs’ strength at the back court. The moral lesson of the series is that we need to have a sort of consistency to win the series and if the momentum is almost in our hands, never fumble it. The series was the proof that any veteran teams can still have chances to reach NBA finals or even winning the title itself.